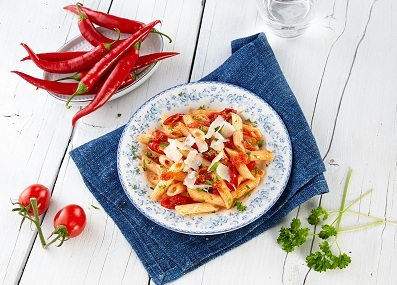 Penne gets you closer to the magic of Italian cuisine and is one of the most popular shapes of pasta. Due to its shape – tubular with outer notches – superbly maintains any sauce. Therefore, it’s traditionally served with sauces arrabbiata, marinara or pesto. Fits perfectly for the preparation of various pasta salads. But you don’t need to be straight Italian chef to have fully enjoyed the penne. It will delightfully serve as a supplement to traditional Czech dishes. Imagination has no limits, so it’s up to you where you use penne and in which recipes you find it tasteful. For inspiration, you can look at your recipes. Rice pasta Risolino never overcooks nor gets sticky. It’s good for roasting or reheating. 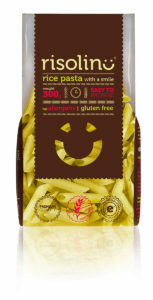 Penne is to be cooked al dente or pleasantly tough to bite. Put pasta into boiling water and cook it on high heat 12-14 minutes. Stir frequently. Best way is to taste.